Start your Earth Day weekend inspired by an unusual pianist/philosopher collaboration. 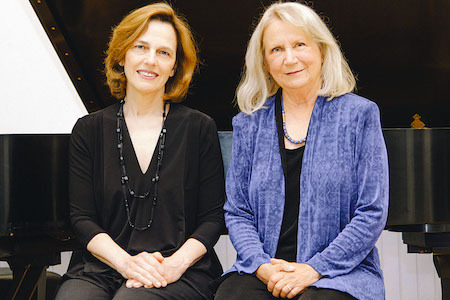 Writer/activist Kathleen Dean Moore and concert pianist Rachel McCabe believe words alone cannot express the urgency of saving the planet’s great diversity of plants and animals from extinction. So the pair has turned to music, joining forces to create a dynamic performance. Moore weaves a literary call to safeguard Earth’s abundance of species into McCabe’s performance of Sergei Rachmaninoff’s “Variations on a Theme of Corelli.” The synergy of words and music creates what an audience member called “as powerful a message as one could imagine.” Unity College president emeritus called the duo’s performance “… truly exceptional. The power, eloquence, wisdom, urgency, and insight of the presentation, the synergy of the music and the reading was brilliant.” This performance uses art to add moral and emotional urgency to the scientific data, providing not only the terrifying statistics of extinction, but also the deep values that make saving species a moral obligation. “This is a call to conscience, to caring, and a call to action,” Moore says. Kathleen Dean Moore, PhD is a career philosopher, retired professor, nature writer, and veteran climate advocate best known for her ability to weave ideas and emotions in her lectures and books. She is the author or co-editor of a dozen books, including Riverwalking, Pine Island Paradox, Moral Ground, Great Tide Rising, and the newest, a novel, Piano Tide. Rachelle McCabe, concert pianist and Professor of Music at Oregon State University, enjoys an international career as an artist-teacher and as a solo recitalist and highly respected chamber musician. She has performed extensively in the United States, Canada, Southeast Asia and England, and has been heard on NPR's Performance Today. Both performers live in Corvallis. Arrive by 6:30 to enjoy light refreshments and learn about community projects in a Liberty lobby filled with local environmental nonprofits and others committed to sustainable lifestyles here in the Columbia Pacific. The approximately 50 minute performance will begin at 7pm and be followed by brief Q&A and other audience engagement. This event is free to the public, thanks to an Oregon Humanities Responsive Program Grant. FREE, No tickets needed.